Staying in popular regions of Greece and the Greek Islands, Crete, Rhodes, Aegean islands, Ionian Islands, Peloponnese, Evia, Corfu, Kos, Santorini, Kefalonia and the Halkidiki penisula. There are more Islands in Greece than one would ever have time to visit but the largest Island is Crete and there are at least 200 other inhabited islands scattered around the mainland that offer accommodation or holiday homes to let in Greece. The Islands of Greece are grouped into various groups of islands: The Argo-Saronic Islands in the Saronic gulf near Athens, the Cyclades, the North Aegean islands off the west coast of Turkey, the Dodecanese between Crete and Turkey, the Sporades off the coast of Euboea, and the Ionian Islands, to the West in the Ionian Sea, the Peloponnese Peninsula and part of the Attica region that is still considered part of the Ionian Islands. The island of Kefalonia or Cephalonia as it is also known, is now perhaps best known as the setting for the book and the film ‘Captain Corelli’s Mandolin’, it is the largest of the Ionian Islands in western Greece. It is renowned for its breathtaking natural scenery with lush forests, breathtaking mountains and high cliffs dropping down to an azure sea. Renting a boat and spending the day visiting secluded beaches reachable only in this way is a popular holiday activity. Horse-riding into the mountains, through ruined villages and ancient vineyards, is another. In the remote western corner of the island there are small villages and private beaches where a centuries old monastery can be found. There are also fascinating geological phenomena, vast underground water networks, subterranean lakes and stalactite encrusted caverns. The largest island in Greece it provides some spectacular locations for holiday homes and villas in Crete as the climate makes it an ideal place for renting a holiday home at almost any time of the year. Located in the southern part of the Aegean Sea it is the most populous of the Greek islands. It provides a significant part of the economy and cultural heritage of Greece but retains its own local cultural traits such as its own poetry, and music. It has an exquisite 1,000 kilometer-long coastline dotted with numerous coves, bays and peninsulas that offer splendid vistas to drive along especially on the West Coast at sunset and a multitude of soft, sandy beaches along the beautifully blue Mediterranean Sea including the spectacular island of Elafonisos in the South East that one can walk or wade across the pink sand to get to see a truly unique ecological treasure of an island. There are also many beautiful historic towns to see while following the rugged twists and turns of the awe inspiring old roads that traverse it’s mountainous interior or lead you along old road from Kissamos to Elafonisos and up along the high coastal roads to view the sunset dipping down over the bays. It is a place of extreme contrasts going from fertile coastal plains covered in olive groves to snow capped mountains and from busy metropolitan cities to very peaceful hillside homes. 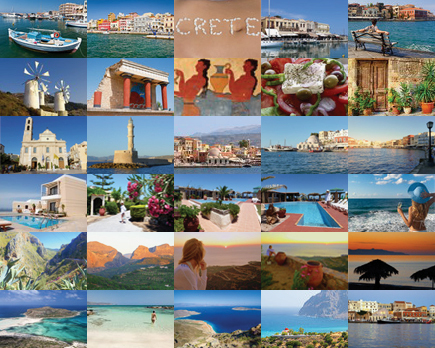 Crete is a quite distinct place which is full of vitality, warmth and hospitality. Holiday Home Lets can even offer you a villa rental in Crete with it’s own wine cellar and distillery and open air restaurant for a true taste of authentic Cretian hospitality and cuisine from a local owner and or a villa with pool with panoramic views of the Sea or on a beach side resort. A holiday home or villa rental in Crete with it’s rich landscape and snow peaked white mountains makes a truly wonderful place to visit both for a Mediterranean beach holiday and as a place to explore the rich history, culture and hospitality on offer. Crete has a good infrastructure so travelling around the island is relatively easy. This allows for visits to a variety of landscapes in relatively short distances. The island has a number of gorges, such as the famous gorge of Samaria, an amazing but long six hour hike through one of the most impressive places in Europe. In contrast, the southern coast of Rethimnon has beautiful beaches, many accessible only on foot. Ierapetra has the distinction of being the southernmost town facing the African coast and enjoys the best weather in Europe, with a temperature that rarely drops below 12 C all year long. Also well worth a visit is Chania, a delightful port town on the north west coast, with an atmosphere reflecting its Venetian and Turkish past. The old town is centered around the harbour and it’s many restaurants where you can enjoy the beautiful light rippling around the bay or wander around the surrounding maze of alleys and houses that have been standing for many hundreds of years with details from all the different epochs including the Turkish Mosque that dominates the Venetian harbour of Chania. Throughout Crete you can clearly see remnants of Roman and Turkish aqueducts and architecture from long ago occupations. Crete, with a population of approximately 650,000, is not just sun, sea and sand; and of course an excellent infrastructure. Crete is well known for its seas and beaches but it has a very contrasting landscape. No doubt Ierapetra, “the bride of the Libyan sea”, is the sunniest holiday resort in Europe. Internet Villa Holidays has hundreds of unpublished listings of holiday homes and villas in Crete and Greece so please contact us directly with details about what you are looking for, and where, and we will send you further information.